“Art, although it is about many things, is almost always about other art,” said Karen Wilkin in The Wall Street Journal. That’s true even for the work of Johannes Vermeer, an artist often thought of as sui generis. Though his scenes of 17th-century, middle-class Dutch domestic life appear inspired by nothing but close observation of the everyday world around him, they can be fully understood only as part of a conversation and competition he carried on with his peers. In the “spectacular” new Vermeer exhibition at the National Gallery of Art, 10 of the master’s paintings appear together with nearly five dozen works by his Dutch contemporaries, and suddenly we can see that the so-called Sphinx of Delft, who bought and sold other artists’ paintings throughout his life, borrowed many ideas about subject matter, composition, and technique from other great artists of his time. 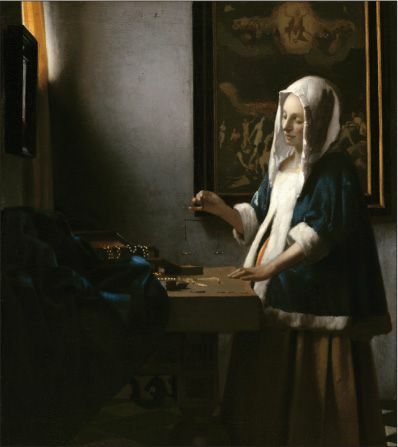 Vermeer was simply a notch better. Even if you ignore every wall label, “you will still have no problem picking out the Vermeers,” said Paul Cantor in The Weekly Standard. The 10 best paintings in the show are unquestionably his: They are “unequaled in the richness and subtlety of their colors and textures, and above all, they have a psychological depth lacking in almost all the other paintings.” Still, the exhibition “does a wonderful job of conveying a sense of the incredible breadth and depth of artistic talent in the Netherlands in the 17th century.” Gerrit Dou’s captivating Astronomer by Candlelight (1665) appears to have inspired Vermeer’s masterful The Astronomer (1668). And though we like to think of Vermeer’s Woman With a Pearl Necklace as a stand-alone miracle of artistic creation, the presence of several slightly older portraits of women in their dressing rooms—by Gerard ter Borch, Jan Steen, and others—suggest we’d be closer to the truth if we thought of Vermeer’s 1664 portrait as a variation on a meme.